This book was originally published in 1985 by Penwell Ltd, Parkwood, Callington, Cornwall, but out of print for a number of years. 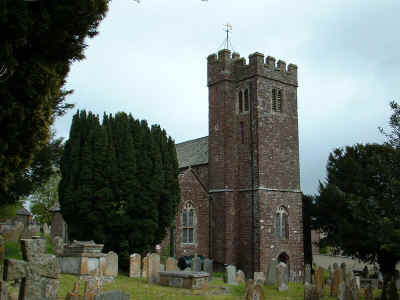 Sandford is an ancient parish, lying 2 miles north-west of the old market town of Crediton and approximately 9 miles north-west of the City of Exeter. 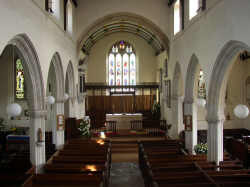 The Parish is made up of a number of small villages, including Sandford itself, but also encompasses the villages of East Village, West Sandford, New Buildings and Preston. The name Sandford has derived from the ancient Sandy Ford and means "over the brook at the bottom of the hill". Evidence of documentation of the parish dates back to a Saxon Charter in 930AD when the village was recorded as sandforda. But it is likely that the village existed long before this time. 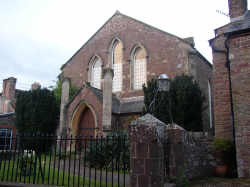 Originally Sandford was regarded as a hamlet of Crediton, but later became a parish in its own right. White (1850) mentions a number of manor houses in the Sandford area. Combe Lancelles, known locally as Combe Lancy was anciently held by the LANCELLES family, but during the C17th it was taken over by the DAVIE family - one of whom was given the title of Baronet in 1641. In 1850 Sir. H. R. F. DAVIE owned this manor and other estates in the area, including Ruxford, but the family actually lived at Creedy Park which was part of the parish of Sandford and about 1½ miles north of Crediton. Other manor houses mentioned were Dowrich House, part of a large estate, anciently held by the DOWRICH family, until 1717 when the last male heir to the estate, Lewes DOWRICH, died after falling off a horse. West Sandford was formerly the seat of the Chichester family, although in 1850 it was owned by John QUICKE, Esq. Another manor, Park House was the seat of John BROWN, Esq. Sandford's St. Swithun's church, dates from the beginning of the C14th, but a church or chapel is believed to have been on the site as early as Saxon times according to a booklet available from the church. Inside are a number of memorials to the DOWRICH and DAVIE families. The church is dedicated to the patron Saint Swithun who was a C9th Bishop of Winchester. Kelly (1926) tells us that St. Swithun's church tower contains a clock that was erected in 1920 by J. J. Hall of Exeter as a memorial to the men who lost their lives in the First World War. Munday (1985) tells us that Sandford's oldest known Market and Fair was connected with its parish church, St. Swithun and held each year on the Monday after the 26th July - this date being the Feast Day of St. Swithun. This became known as the "Summer Fair", although the exact date of when this even first became established is not know. But Munday goes on to tell us that from a report that appeared in the "Trewman's Exeter Flying Post" on the 22nd March 1842, another Market and Fair, the "Spring Fair" appears to have been established by a James Daw of the Star Inn in Sandford (he was also an auctioneer). Munday (1985) tells us about the Public Houses that were in Sandford and its surrounding villages in the past and of the hops that still grow wild in the hedgerows of the parish. All Inns in the past would have brewed their own ale from the hops that grew in the local hedgerows. 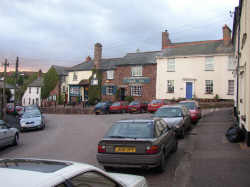 The Lamb and the Rose and Crown, are possibly Sandford's oldest Inns, dating from the 16th century and both originally Coaching Inns. The Lamb and the Rose and Crown are still public houses in Sandford today, although both experienced fires in 1843 and 1896 respectively and therefore have both been rebuilt, but neither of them now having thatched roofs. There was also another Coaching Inn at New Buildings called the Hare and Hounds which lay on the main Stage Coach route between Barnstaple and ran through Morchard Bishop, New Buildings and then Chumleigh before going onto Crediton. But the later opening of a new road between Barnstaple and Crediton saw its decline and the former Hare and Hounds then became a cottage around 1910. Along with its pubs, Munday goes on to tell us that the area also had a number of Cider Houses which would have brewed their own cider and sometimes bought supplies from the local farms. These cider houses included the Star Inn at Sandford which had a fire in the 1850's and later became a butchers. 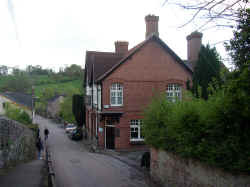 The Black Horse at Sandford and also the New Inn at East Village were also Cider Houses. Sandford's National School was built in 1825 by Sir Humphrey Phineas DAVIE, Bart. 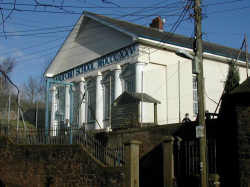 and is still the village school today. You can find out a little more on Sandford school and education in the villages of Newbuildings and East Village by visiting the following page: Education in Sandford, New Buildings and East Village. Some more history about the school is detailed on the Sandford School website. Like many of the villages in the area, Sandford still looks very much as it must have hundreds of years ago. It covers an area of about 7770 acres of agricultural land. In Kelly's (1893) the main crops grown in the parish were wheat, barley and roots. Today, as in years gone by, the main industry of the area is still cattle and sheep farming. Sandford in GENUKI giving information about the parish and an old map of the Parish Boundaries. Sandford Community Website provides local information about the parish. Sandford Heritage Trail (PDF 949KB) providing a short circular walk from Sandford and details about some of the older buildings in the parish. Sandford School with some history about the school.